Find your perfect accommodation choice in La Manga, View all our holiday rentals in South East Spain. Discover what blissful self-indulgence and ultimate freedom can be achieved from staying in a private holiday rental apartment or villa in La Manga Del Mar Menor Costa Calida, ! 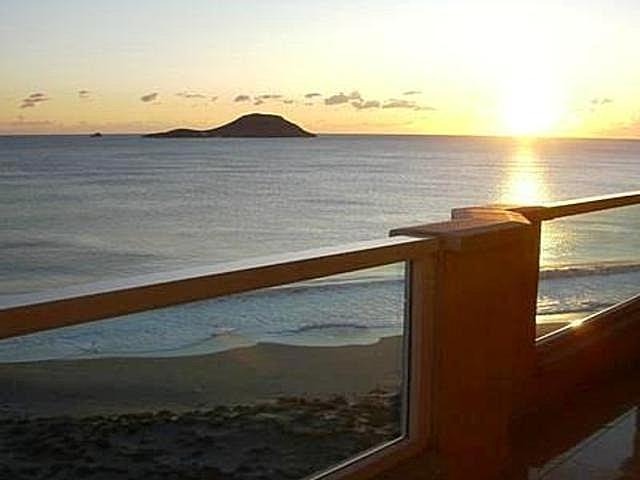 This entry was posted in Accommodation with Communal Pool, Affordable Beach Resort Spain, Affordable Luxury Apartment Rental, Apartment Rental La Manga, Beach Holidays - Self Catering, Beachfront apartment, Cheap Costa Calida Holidays, Child Friendly Apartments in Murcia, Family Holidays - Beach List - Child Friendly, Family Holidays in Murcia, Family Vacations La Manga del Mar Menor, Holiday La Manga Strip, Holiday Lettings La Manga, Holiday rentals Region of Murcia, Holiday villa in Veneciola, Playa Principe Villas La Manga, Private holiday lets la manga spain and tagged #holiday rentals, Holiday Accommodation, Holiday apartments, holiday homes, holiday houses, holiday villas on November 7, 2018 by Tony Preston ( La Manga Holiday Rentals ). Rent This Penthouse on the Mediterranean bay Gran Vía de La Manga, km. 10 – Km 12. Book the amazing sea view Penthouse for your family holiday From £195.00 GBP Per Week, ideally suited for couples and families alike who enjoy unadulterated luxury beach side holidays at affordable prices. You can swim in the warm waters of the Mediterranean as well as the Mar Menor or in the private pool area. La Manga del Mal Menor in Spain is a tourist town located in Murcia, and is divided into various districts: Cartagena, San Pedro de Pinatar, Los Alcazares, and San Javier. There are 24 km of salt lake that surround the area, called the Mar Menor (Minor Sea). Playa Principe Mediterranean Beachfront Apartment. The private rooftop terrace is included with four sun loungers. The Pizzeria Di Mare has a prime location, nestled between two seas – La Manga del Mar Menor. It offers a range of typical Italian cuisine, including good meats and fish. La Manga, a strip of land some 21 km long, narrowing to 100m in some places, lies between the Mediterranean and the Mar Menor, the largest salt water lagoon in Europe. It is renowned as a very healthy environment and on beaches on the Mar Menor you can collect therapeutic mud, used to alleviate skin and joint ailments. But it is much more than that! With clean beaches on both sides you have 40km of sand and sea to choose from. So to start with, if you are looking for a relaxing holiday with the family by the sea, this is the idea place for you. All the residences we offer have their own pool, so the choice is yours – pool or beach, or both. The waters of the Mar Menor are shallower and warmer than those of the Mediterranean and therefore ideal for children. In some places, by the Paquebote restaurant or in the El Estacio area for example, there are inflatables in the sea for both children and adults. There is always a beach bar close by to enjoy. For those who wish to combine their stay with more activities, La Manga and the area around offer a wide range of aquatic sports. In La Manga itself you have the choice of kayaking, jet-skiing, wind-surfing, kite-surfing, boat and ferry trips (from the Tomás Maestre marina) and diving in Cabo de Palos, which is renowned for its numerous diving centres and schools. Suitable for all ages. For the more energetic and especially if you are staying in La Manga Club, there are a wide range of cycling and walking routes through the hills and along the Mar Menor. Perhaps you are looking to play tennis and paddle. Some of our residences have their own courts and there are many more in La Manga Club, as well as in Mar de Cristal, on the Mar Menor. Golf is another major activity in the area – there are three world-famous courses in La Manga Club, as well as a number of others in the area. Horse-riding is available near La Manga Club and in Los Belones. If you wish to entertain small children, then by Plaza Bohemia in La Manga is the “PequePark”, with a range of rides, go-carts, inflatables and activities, open from 19.00 in the summer. This is an old naval port, dating from Roman times, now visited by major cruise lines. It is set on an impressive, large bay with fortifications on the hills either side and is home to a number of museums and Roman sites. There you will find preserved the first viable submarine in the world. It is a beautiful place in which to stroll along the typically Spanish streets, enjoy tapas and perhaps do some shopping! Park in the underground carpark in the port and you will immediately have so much at your fingertips. This is situated close to the town of La Unión, between la Manga Club and Cartagena. Here you can experience the mining history of the area, dating back to Roman times. A “train” takes you through the area and you can go down a mine to experience what it was like to work underground. An exciting experience for children. This is a protected nature reserve between La Manga and La Manga Club. It is an unspoilt paradise of hills, long beaches and sea. Totally undeveloped, without beach bars or facilities but an excellent day out away from everything. Take a picnic and plenty of drinks! This is a small fishing port at the beginning of La Manga. It is a beautiful location for sitting on the waterfront, enjoying the sun and tapas, as well as watching the boats come and go. As mentioned, it is known for its diving schools as well as for its wide variety of fish restaurants, either overlooking the port or on the beach. At the beginning of La Manga are the salt lakes (Salinas) which are home to a wide range of bird life and flamingos in particular. They get pinker as the summer progresses! Also, on the other side of the Mar Menor you will find the working salt lakes in San Pedro de Pinatar, which are much bigger and are in a popular area of beaches and dunes, so ideal for spending the day there. La Manga and the surrounding area offer a wide range of restaurants, for all budgets and tastes. There are a wide variety in La Manga Club itself and close-by. Cabo de Palos, as mentioned, offers many restaurants specialising in fish dishes and paella. B & F ferries (00 34 649 201 610) run a regular passenger (& bike) service across the Mar Menor – between the small seaside town of Santiago de la Ribera (near San Javier International Airport) and Puerto Tomás Maestre. The timetable is seasonal. This entry was posted in Accommodation with Communal Pool, Apartment Rental La Manga, Apartment Short Term Rentals, Apartments & Penthouses with panoramic sea views, Beach Apartment Rentals La Manga and Mar Menor, Beach Holidays - Self Catering, Beachfront apartment, Best Beach Apartments Spain, Casa/Apartamento Playa Príncipe, Child Friendly Apartments in Murcia, Edificio Playa Principe La Manga, Family Holidays - Beach List - Child Friendly, Family Holidays in Murcia, Family Vacations La Manga del Mar Menor, Holiday La Manga Strip, Playa Principe La Manga Strip, Playa Principe Villas La Manga, Self catering holiday apartment on La Manga Strip, South East Spain, Spain Beach Apartments Playa Principe Beach Apartments, Tomas Maestre marina, WiFi Wireless Internet Access and tagged 2 Bed Penthouse, 2 Bedroom Apartment in Region of Murcia, accommodation, activities in Region of Murcia, attractions in Region of Murcia, Gran Vía de la Manga, Holiday, holiday Penthouse, holiday Penthouse Mar Menor, km. 10 - Km 12, mar menor golf apartments, mar menor golf resort, mar menor news, mar menor property bargain, Murcia & Costa Calida, Region of Murcia, Rental, reviews, Spain, things to do in Region of Murcia, Travel, vacation on April 22, 2018 by Tony Preston ( La Manga Holiday Rentals ). La Manga is a popular destination for holidaymakers from the United Kingdom, Ireland and northern Europe. 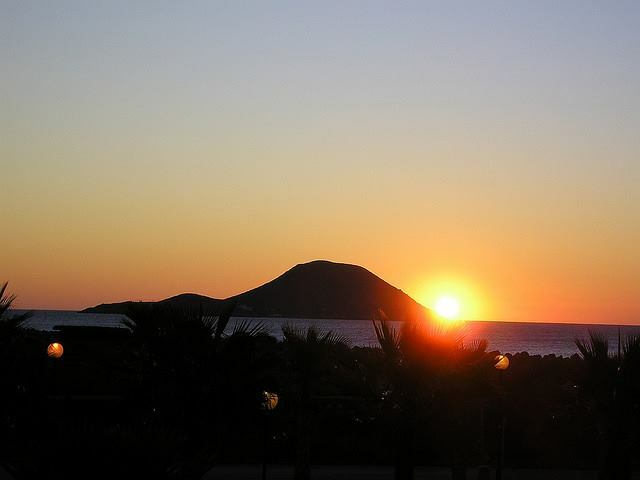 Holiday rentals in La Manga comprise a choice of apartments, bungalows, townhouses and private villas. The beach area offers visitors a great variety of holiday apartments, from apartments for 1 or 2 persons and families to large penthouses and villas that sleep up to 8 persons. This area is perfect for families with young children that love to be by the sea and there are many beaches to choose from that are all within an easy walk from your accommodation. The residential areas of La Manga Strip can all be reached by bus and most are not more than 5 minute walk from the beach front. Here is where you will find the majority of holiday homes, many of which have either private or communal swimming pools and gardens. 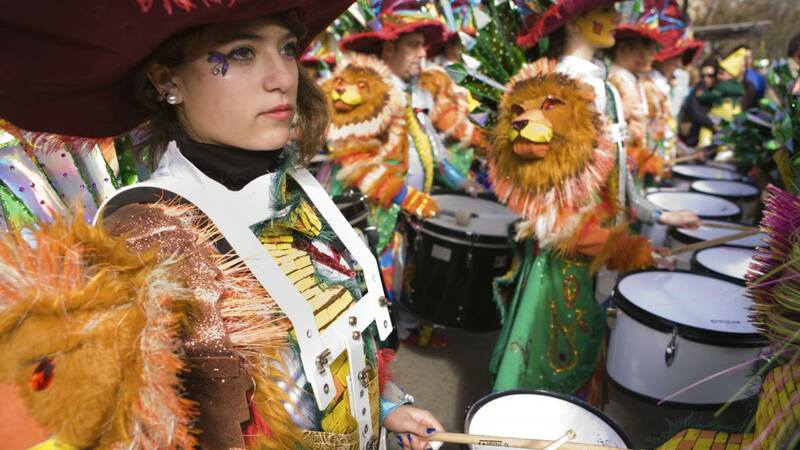 Depending what area you choose there are a variety of attractions and great things to do. You can swim in the warm waters of the Mediterranean directly in front of the apartment (perfect for an early morning swim before breakfast!) Or you can swim in the Mar Menor to the rear, which due to its shallow warm waters make this an ideal environment for young children who want to swim or learn to swim in the sea , alternatively there is the private pool area which are all conveniently located right on the doorstep of the apartment. There are Water sports of all kinds, Jet Skiing, Sailing, Fishing and Diving within easy reach. Visit Calblanque Natural Reserve where there is an abundance of interesting flora & fauna among the hiking trails. The Tomas Maestre Marina is the largest Marina in the Region of Murcia. 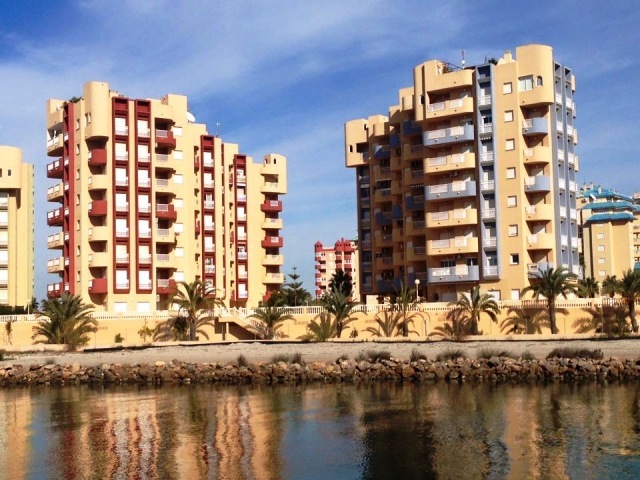 It is located at the northern end of the La Manga Strip on the Mar Menor. From here you can hire a boat, go scuba diving, fishing etc. There is also a ferry which sails to Sandiago de la Ribera every hour and a tour boat which sails into the Med and around the islands in the Mar Menor. All holiday rentals come fully furnished and equipped with all you will need including bedding, towels, kitchen utensils and in some cases free Wi-Fi. One Bedroom, Sleeps 2/4, Sea Views, Spectacular Swimming Pool. This entry was posted in Accommodation with Communal Pool, Affordable Beach Resort Spain, Affordable Luxury Apartment Rental, Cheap Costa Calida Holidays, Child Friendly Apartments in Murcia, Family Holidays, Family Holidays in Murcia, Holiday La Manga Strip, Holiday Lettings, Holiday rental accommodation, Internet/ Broadband/WiFi Holiday, Mar Menor Beach Apartments, Self catering holiday apartment on La Manga Strip, South East Spain, Spain Beach Apartments Playa Principe Beach Apartments, Spain's Secret Paradise Between Two Seas, Spanish Penthouse with a great sea view, Villa Rental La Manga Strip and tagged apartments, bungalows, Holiday apartments, La Manga, Mar Menor, Mar Menor Management Services, Property & Villa Management, Property Management in La Manga Strip, Property Management Services, Spain, townhouses, villa management la manga on May 14, 2016 by Tony Preston ( La Manga Holiday Rentals ). This entry was posted in Apartment Rental La Manga, Apartment Short Term Rentals, Apartments & Penthouses with panoramic sea views, Beach Apartment Rentals La Manga and Mar Menor, Beach Holidays - Self Catering, Beachfront apartment, Best Beach Apartments Spain, Casa/Apartamento Playa Príncipe, Child Friendly Apartments in Murcia, Family Holidays, Family Holidays - Beach List - Child Friendly, Family Holidays in Murcia, Family Vacations La Manga del Mar Menor, Holiday La Manga Strip, Holiday Lettings La Manga, Holiday rental accommodation and tagged close to beach & shops, Holiday Rental House 3 Bedrooms, Luxury Villa 3 Bed 3 Bath, Modern very well Equipped apt communal pool, Murcia, Pool - Free WiFi - 100m Walk to Beach, South Facing Apartment overlooking the pool on April 7, 2016 by Tony Preston ( La Manga Holiday Rentals ). This entry was posted in Apartment Rental La Manga, Apartment Short Term Rentals, Beach Apartment Rentals La Manga and Mar Menor, Beach Holidays - Self Catering, Cheap Costa Calida Holidays, Child Friendly Apartments in Murcia, Family Holidays, Holiday Lettings La Manga, Holiday rental accommodation, Holiday villa in Veneciola, La Manga Strip Peninsula, Mar Menor Beach Apartments, Penthouse Sea Views La Manga Strip, Playa Principe La Manga, Spain Beach Apartments Playa Principe Beach Apartments, Spain Costa Calida 2 Bedroom, Uncategorized and tagged 2 Bed Penthouse Holiday Apartment, apartments for rent private, Beautiful Beaches, Family Spanish Resort, Nature Reserve and Mar Menor Lagoon, Spain Costa Calida 2 Bedroom, villas in murcia with private pool, Visit real Spain and enjoy a family holiday on April 1, 2016 by Tony Preston ( La Manga Holiday Rentals ). Excellent Argentine steaks, can cater for large crowds, great starter menu. Thai Restaurante Yaho Cabo De Palos. This luxury 1 bedroom holiday apartment on the Mediterranean side of the La Manga strip has Internet/ Broadband/WiFi , The balcony is the perfect place to eat, or have a glass of wine, while enjoying the sea views. All rooms lead off from the balcony-only the sounds of the sea can be heard. There is a private communal pool and parking area. The apartment sleeps 4 people. It has a double bedroom and twin beds in the lounge (although there is another spare bed available so a 5th person can be accommodated at no extra cost). It is on the 6th floor of the apartment block high enough to get great views but not too high to not get the benefit of the proximity to the sea with the restful and relaxing sound of the waves. The patio doors in the bedroom and sitting room open onto a spacious 12 square metre balcony which is not overlooked by any other apartments giving total privacy for sun bathing, as well as providing a good view to the pool, gardens and two seas. Fully equipped fitted kitchen with cooker hob, fridge freezer, and microwave. There is also a separate utility / laundry area built on the balcony with a washing machine and a sink. The lounge has a dining area, 32” TV with access to satellite channels, CD/midi system for your entertainment, Wireless internet access is available at an additional cost of 20 euros per week or 35 euros for 2 weeks, payable locally. * Subject to availability and compatibility with customer’s equipment. Access to internet services is chargeable and may be subject to change It has two sofas, one of which converts into a double bed and a separate (spare) single bed. Bedding etc is provided. The apartment in the Playa Principe has stunning views of both the Mediterranean and Mar Menor and is located directly on a long sandy beach. It is convenient for nearby bars restaurants, supermarkets and banks, and the famous Tomas Maestre marina is a short stroll away. The Mar Menor is fantastic for water sports, golf and tennis enthusiasts and is only a short drive from Murcia airport. For the sports enthusiast the nearby world famous La Manga Golf and Country Club offers 3 golf courses and numerous other sports facilities. The apartment is situated in a peaceful location and has a shared pool which is set overlooking the beach. Next door there is paddle tennis courts and coaches. 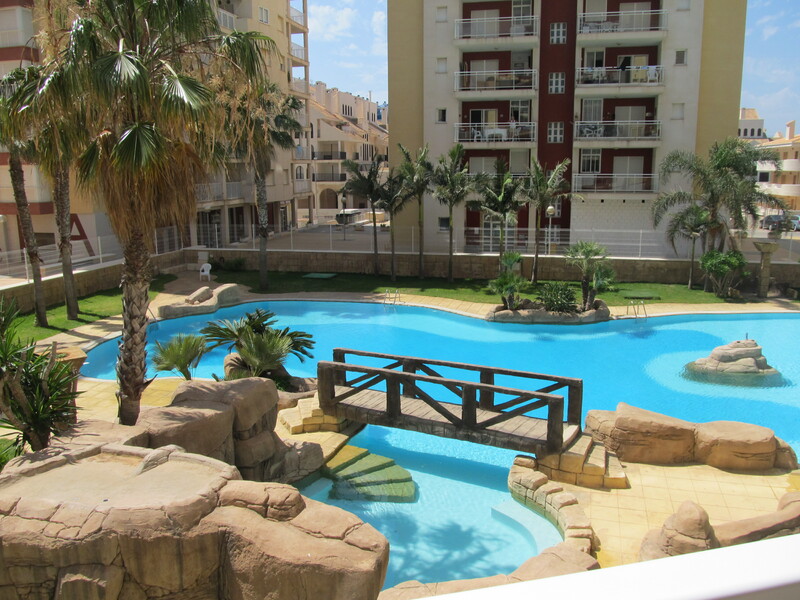 From the balcony you have the fantastic views to the Mediterranean Sea, Mar Menor and the La Manga strip. There is a quiet pool area with small garden and view to the Mediterranean Sea, and if you feel like going to the beach then you can just walk out the door and you will be at the Mediterranean Sea with finest white sand, 15m on the other side of the road you will find the shallow Mar Menor with a small beach, and 200m further down you will find the Mistral beach at Mar Menor. If you like to play golf approx 4 km from the apartment you will find the Veneziola Golf with a 9 hole pitch & put course and a driving range, and approx. 13 km from the apartment you find Club La Manga with its 3 championship courses, tennis, football and night club. There is a lot of activities on the La Manga Strip i.e. beach, swimming, scuba diving, sailing, jet skis, boat trips, windsurfing, kite surfing, fishing, boat hire, paddle, tennis, football, horse riding, cycling, quad bikes to hire, go kart , restaurants , beach bars, casino, shopping. There are plenty of supermarkets to do your food shopping some within walking distance, there is a small grocery store for milk and essentials also a fresh fruit shop, bakery and a Chemist within a 10 minute walk. There are a number of larger supermarkets along the strip to do a full shop for the week if you need to, many of them sell fresh Fruit and fresh Fish. This entry was posted in Accommodation with Communal Pool, Affordable Beach Resort Spain, Affordable Luxury Apartment Rental, Apartment Rental La Manga, Apartment Short Term Rentals, Apartments & Penthouses with panoramic sea views, Beach Apartment Rentals La Manga and Mar Menor, Beach Holidays - Self Catering, Best Beach Apartments Spain, Cheap Costa Calida Holidays, Child Friendly Apartments in Murcia, Edificio Playa Principe La Manga and tagged Beach Holiday, Mar Menor, Mediterranean Beach Apartments La Manga, Playa San Javier, private holiday lets la manga spain, Recommended Family Holidays, Romantic Apt Private Roof Terrace, San Javier Beach Apartment, Self Catering, Tomas Maestre marina, vacation on March 4, 2016 by Tony Preston ( La Manga Holiday Rentals ). Cheap Weekend Short Breaks in Murcia Late Summer Sun Or Plan Ahead For An Autumn Break or Spring Break On Spain’s Costa Calida if you are looking for self catering family holiday rentals villas and apartments near The Mar Menor, the translated little sea “is a favorite spot for those seeking a family holiday. It is called “the world’s largest swimming pool” because of its warm temperatures. Since it is also superficial, play is an ideal place for children to their hearts. La Manga del Mar Menor is convenient to a number of important tourist sites. It is only a few hours of major centers such as Murcia and Cartagena. This means more opportunities for families to explore the best of Spain. Both cities have a rich history that both the interest of children and adults. Museums, ancient ruins, churches and monuments to attract tourists on family vacations. Even the youngest family members will appreciate the Maritime Museum in Cartagena and the Bullfighting Museum in Murcia. De Torrevieja Water Park (Torrevieja Aquopolis) was also in a few hours drive from La Manga del Mar Menor. .
Murcia is a unique location it offers a wealth of activities for visitors. The area boasts both the waters of the Mediterranean and those of the Mar Menor. The Mar Menor is formed from a protruding sleeve of land ( The La Manga Strip ), which encloses the largest salt-water lagoon in Europe. This has created a wonderful area for water sports enthusiasts, where you can try your hand at water skiing, sailing, windsurfing or even power boating and the increasingly fashionable kite-boarding, making it a perfect place to keep the whole family entertained. This entry was posted in Affordable Beach Resort Spain, Apartment Rental La Manga, Apartment Short Term Rentals, Apartments & Penthouses with panoramic sea views, Beach Apartment Rentals La Manga and Mar Menor, Beachfront apartment, Cheap Costa Calida Holidays, Child Friendly Apartments in Murcia, Family Holidays in Murcia, Holiday La Manga Strip, Holiday Lettings, Holiday rental accommodation, Holiday rentals Region of Murcia, Mar Menor Beach Apartments, Murcia, Penthouse Sea Views La Manga Strip, South East Spain, Spain Beach Apartments Playa Principe Beach Apartments, Spain's Secret Paradise Between Two Seas, Spanish Penthouse with a great sea view, Tomas Maestre marina, Urbanización Playa Principe and tagged #holiday rentals, accommodation, Apartment, Apartment Rental, apartments, Cheap Weekend, Costa Calida, Holiday, Holiday Accommodation, holiday apartments to rent, holiday rental, homes, inexpensive, la, manga, rent, Rental, rentals, Short Breaks, sleeping accomodation, Spain, spring break, strip, villas on February 29, 2016 by Tony Preston ( La Manga Holiday Rentals ).